In our more than 40-year tenure, Polhemus technology has powered many 3D laser scanning applications around the world. We are proud that so many cutting-edge applications in health care, military, and research and technology are powered by Polhemus. Link to specific case studies below in the areas of orthotics and prosthetics, reverse engineering and rapid prototyping, and more. Below is just a sample of notable applications in 3D scanning that have enabled our customers to break new ground and redefine the standards in their fields and industries. For a more detailed look at Polhemus scanning applications, go to: scanning case studies. No more plaster casting! FastSCAN has revolutionized the process of fitting prosthetics and orthotics, leaving the plaster mess behind. The scanning process is quick, clean and there is no pain. FastSCAN is being used in more than 700 O&P clinics worldwide. FastSCAN continues to be the leader in orthotics and prosthetics. When it comes to cosmetic and reconstructive surgery, skill, artistry and technology must blend to achieve aesthetic results. FastSCAN provides an advanced comparative tool with the ability to perform volumetric analysis both pre-op and post-op. 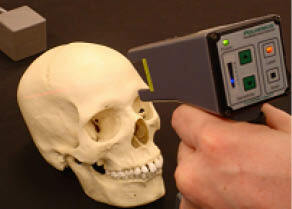 FastSCAN has also been used in oral and maxillofacial surgery. FastSCAN™ is perfectly portable and easy to bring directly to the field for highly accurate scanning of relics, and for replication and digital archiving. It's been used in archaeology in a number of ways, including: the Joint Mongolian-Smithsonian Deer Stone Project, and a study on the 3D orientation of archaeological fragments coming from a Gothic spire. FastSCAN™provides the technology to become more efficient in the production process by producing digital 3D models. When manufactured parts when a blueprint is not available in order to remanufacture it. 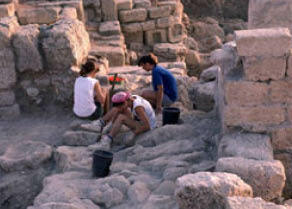 FastSCAN has been used for a variety of projects. 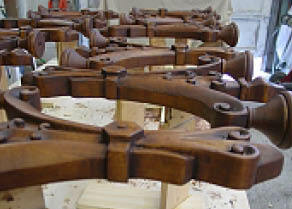 Examples include reverse engineering for vehicles and rapid production of guitars. The portability of FastSCAN makes it easy to take with you on the job. With the freedom to move around the object as needed to get a complete scan image in seconds, FastSCAN has been the ideal choice for projects that require custom manufacturing, 3D scanning for woodworking, and 3D scanning for restoration work. The outcome has been a great savings in time and money, while achieving quick, precision results. 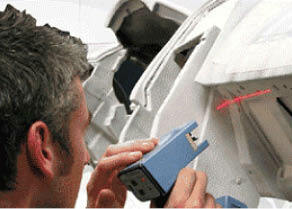 FastSCAN™ is one of the latest tools introduced into the forensic market. It's the most portable, lightweight, cost-effective scanning solution available, allowing you to bring the scanner to the scene. 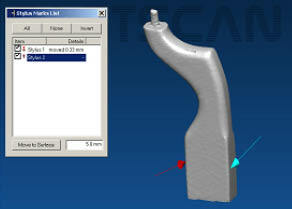 FastSCAN helps improve accuracy and efficiency of measurement documentation by providing an instant 3D representation. Optional for the scanner is the Stylus, which provides position and orientation markers for reference landmarks. 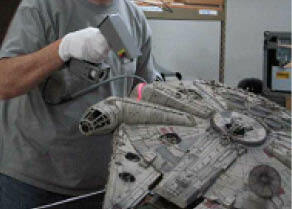 FastSCAN has been used by numerous artists for 3D rapid reproductions of artwork. This has proven for many artists to allow them to focus more time on creating, saving both time and money. 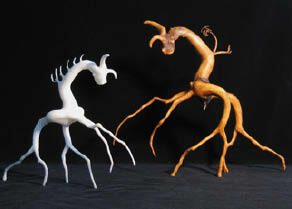 FastSCAN has successfully digitized world renowned sculptures, resulting in a much less labor intensive process--and FastSCAN has enabled 3D rapid prototyping to replicate unique mixed media art. FastSCAN™ files import easily into many graphic arts software packages for image manipulation and texture mapping. 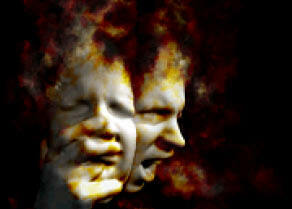 Dan Short, from the Art Institute of Philadelphia, had his face scanned with two different expressions. The scans were exported as .3ds files to be used in 3D Studio Max. The final art was achieved using rendering with a camera, adding color and using a custom brush for effects (photo courtesy of Dan Short). By adding accessories, you can do more with your 3D shape capture. By adding a stylus and software, you have the ability to make linear, circumferential, radial and volumetric measurements of complex three dimensional surfaces. At right is a scan of an object using the FastSCAN and Polhemus Stylus markers. Widely used in the entertainment industry for character animation and computer games, FastSCAN has made its mark in the entertainment world in a number of ways, including appearances in television shows, and used in a variety of hollywood blockbuster movies. Below are just a few of the ways FastSCAN has been used in entertainment and 3D animation. (photo courtesy of Gentle Giant Studios).